Hansen, E.J. (2011). 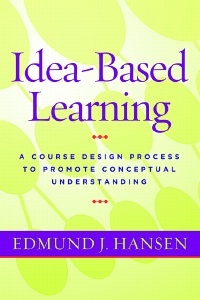 Idea-based Learning: A Course Design Process to Promote Conceptual Understanding. Stylus Publishing. This book is of equal value to someone brand new to teaching and designing a course for the first time as it is to someone who has been teaching for many years and is looking for some new ideas to “tweak” an assignment or class activity just a bit. Glance at the 10 chapter titles in the Table of Contents and you will find that each one is subdivided into small well-described chunks (much like good course design!) In fact, I found the sub-titles so interesting that first I started picking and choosing various places in the book to read based on that alone. It is also a book that you can ‘browse’ through, coming across specific course and discipline examples, as well as clearly laid-out charts and figures that you can easily apply to your own context. So what is idea-based learning? Think about a course you currently teach, or are planning. Whatever the discipline, sub-specialty, class size or level, ask yourself, “What are the big ideas in the topic of my course?” Hansen helps you to think about this: it could be a major theory or a core concept, but it also could be a core skill, value or attitude. It is something essential to the discipline and in your course. Once you have come up with one or more big ideas, Hansen guides you through what he and others call ‘backward design’ but what I call plain old good course planning (!). You will identify learning outcomes based on the big ideas and associated “enduring understandings” and “essential questions” – the latter may help you think about a big idea for your course – what is a question with which you hope to engage students? You will also consider student background, assessment tasks, class activities and in doing so, will create rubrics and practice opportunities, and consider sequencing and packaging. Not only does Hansen explain each step of the way in very clear language with lots of examples to draw from, but also he adeptly explains why you would want to do these things through reference to the literature to show us the theory behind it and/or efficacy based on empirical evidence. From my reading of this valuable book, the “big ideas” are that it is most definitely not content-based learning, and it emphasizes the big picture to help students keep focus. 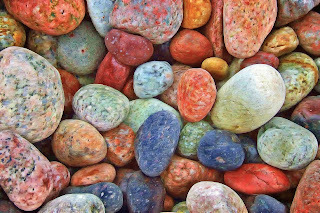 An “endured understanding” is that conceptual understanding and deep learning is a result of the technique. An “essential question” is: How can I have students “do the subject” and explore the issues of the course, which brings us back to the big ideas in Idea-based Learning. I have incorporated some of Hansen’s ideas into online seminars I have led for Magna, on motivating students and on alternatives to lecturing. Might some of Hansen’s ideas and examples help you to enhance your course and your teaching practice? I am sure they will. This is a great book, I've seen a copy of this book last week and I am looking forward to see everything next week. My Arizona SEO team is looking forward to buy this book next week. Thanks a lot for sharing!